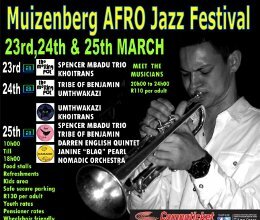 The Spencer Mbadu Trio, featuring Charles Louw on Piano and Carlo Fabe on Drums with Spencer on Bass and vocals.Spencer is considered one of the top jazz musicians in our country. He has played all over the world and brings an unique intimate story telling experience through his music and word. Janine �Blaq� Pearl is considered a scoop for the festival and her rendition of Jazz will simply entrance you and to top it all we have the foot stomping, swinging, Gypsy Jazz of the dynamic Nomadic Orchestra, this amazing ensemble includes a Tuba,Saxophone, Trumpet, Drums and guitar and will get everyone dancing. Expect to have lots of fun and both venues offer an intimacy seldom seen in live music performances any more. Price: R110, Tickets are available at computicket.